Get Custom Oligo Synthesis with the Best Innovative Quality – Bio-Synthesis, Inc.
found useful in various laboratory procedures.Oligonucleotides are applicable in the field of medicine and molecular biology. One of the most common usages of synthetic Oligonucleotides is as an antisense Oligonucleotides, primers of DNA amplification and sequencing, for artificial gene synthesis, interfering RNA and probes from detecting complementary RNA or DNA through molecular hybridization. Creating a custom Oligonucleotide is useful as it binds to the region of the DNA which is complementary to the custom Oligonucleotide sequence. It is also used in making primers that are crucial in replication of PCR allowing the amplification of targeted segments in the DNA. Custom Oligonucleotide synthesis also allows restriction sites to be added to the desired Oligonucleotide. Though the length of a custom Oligonucleotide is generally 15 to 20 bases, it has the capability to limit the additional sequences that can be added to the primer sequence. The synthesis of Oligonucleotides is a chemical synthesis of fragments of nucleic acids. The synthesis is useful as it provides an inexpensive access to custom Oligonucleotides that are of the desired sequence. Chemical oligonucleotide synthesis is carried out in 3’ to 5’ direction. The enzyme synthesis, on the other hand, synthesizes RNA and DNA in a 5’ to 3’ direction. The present process uses a phosphoramidite method and is implemented as a solid phase synthesis. The building blocks are derived from protected ribonucleosides (A, C, G, and U), 2′-deoxy-nucleosides (DA, DC, dG, and T) or nucleosides which are chemically modified such as LNA. The sequential coupling of the building blocks is used to obtain the required oligonucleotide. The coupling helps the oligonucleotide chain to grow as required by the sequence of the product. When the process is completed, the product is released from the solid phase into a solution which further acts to de-protect it. The limits for the synthetic oligonucleotide length are set by the occurrence of the side reactions. This is due to the accumulation of errors during the synthesis of the oligonucleotide. 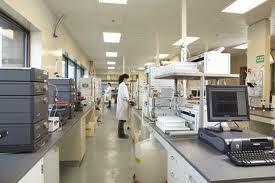 The products are then isolated with the help of HPLC. This is done to ensure the obtained oligonucleotide is high in purity and is of the desired nature. The synthesized oligonucleotide is generally RNA or DNA molecule which is single stranded along with 15-25 bases in length.